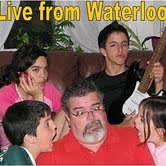 Live from Waterloo: Mc Idiot's 3 - I win! Mc Idiot's 3 - I win! First of all, I'm not a masochist, OK? We were waiting for Juan and Caro to finish their rehearsal, and it was really hot, so we decided to go and have an ice cream. The only place around was the McDonald's across the street, so there we went. We all had an ice cream cone, and oddly enough I finished it first. So I went back to the counter with my empty cone, and asked the girl for a refill. And she gave me one!!! As I said, I win. Next time, I'm going back with a double quarter pounder with cheese box and an empty box of fries. Refill that!